Amizade is a Pittsburgh nonprofit that has been working to inspire empathy, catalyze social action, and link diverse communities through Fair Trade Learning since 1994. “Over 10,000 individuals have served with local community leaders in 12 countries on 4 continents with 16 partnerships. From working with women and girls on rainwater harvesting initiatives in rural Tanzania to running at-risk youth camps in Jamaica, Amizade volunteers have transformed and been transformed”. I served as a Social Design Intern for 8 months with Amizade. As a social designer, I apply creative problem-solving tactics to complex and systematic social issues. But because I am only one year into my career, I am still defining where and how my social design can be useful. Amizade caught my eye not just because I am very interested in cross-cultural learning and international relations, but also because they are innovators. Amizade broke new ground in the field of global education by pioneering the concept of Fair Trade Learning, because unfortunately equitable outcomes and symbiosis in service learning and international study are often overlooked. The Fair Trade Learning guidelines alone are a great example of social design, and thus I knew that Amizade was the perfect place for me to test the waters. The main project that I worked on was the launch of a new grant-funded program that encouraged their alumni and affiliates to catalyze social action in their own communities. 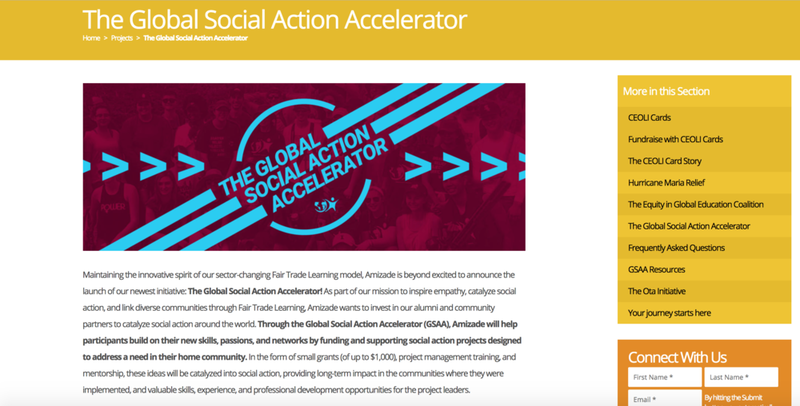 Through the Global Social Action Accelerator (GSAA), Amizade will help participants build on their new skills, passions, and networks by funding and supporting social action projects designed to address a need in their home community. In the form of small grants (of up to $1,000), project management training, and mentorship, these ideas will be catalyzed into social action, providing long-term impact in the communities where they were implemented, and valuable skills, experience, and professional development opportunities for the project leaders. Why is this important? Survey data and Amizade’s 24 years of experience indicate that the benefits of global volunteer work are amplified and nurtured by the professional development and new networks that volunteers acquire from their experience. After a three year review of global volunteer impact, we believe that the next step forward to make more people better off and remain connected is to build on our participants’ (both visitors and hosts) new skills, passion, and networks, and invest in them to catalyze new social action projects all over the world. The GSAA is Amizade’s answer to two of the worst challenges in global volunteerism: (1) a legacy of development failures and (2) lost opportunities in the “re-entry” phase, when people return to their home communities inspired to be better global citizens but have no guide or outlet to do good work. Having completed service work, social entrepreneurs like our alumni and community partners around the world now feel confident in their ability to positively impact their community, and Amizade wants to help cultivate that drive. While the meat of the project was already established, I used my design-thinking skills to help develop the layout, advertisement, and implementation of the project. 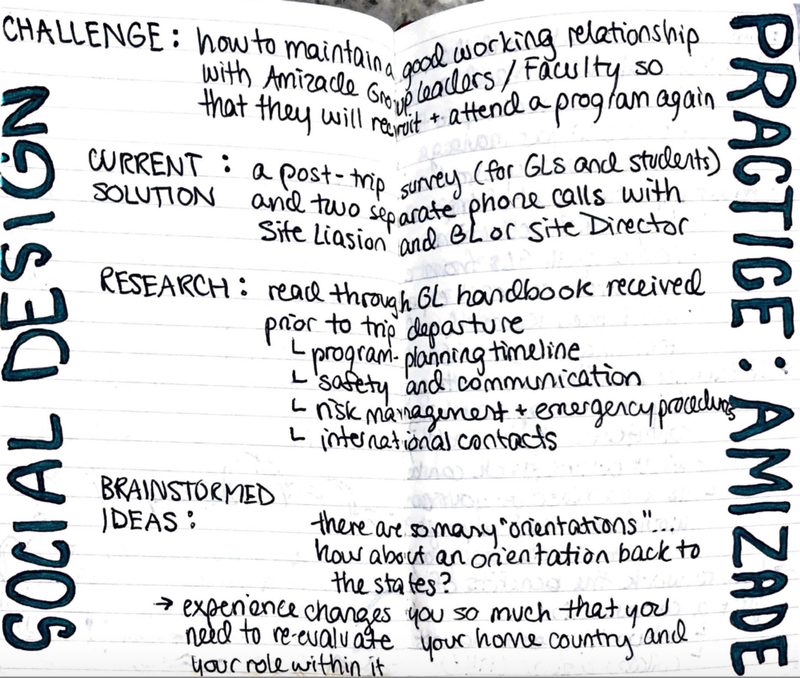 In doing so, I envisioned the entire process of an Amizade alumnus from the actual original trip throughout the duration of the GSAA project and pinpointed where the participant could draw on their experiences to inform their proposal. My preliminary research included conversations with key Amizade staff involved with different aspects of the Amizade experience, reading the details of the grant proposal, compiling a list of resources to support applicants in their project development, looking into comparable programs, and more. My deliverables took the form of thought-mapping (see images below), copy for the grant description (see above quote), the application/resources, and materials for a design-thinking workshop during the skills development portion. The winners of the grant were not chosen until after my internship ended, so I did not end up being a part of that process. Amizade has a large network of professionals who work as group leaders (GL) — any faculty, staff, or professional who accompanies an Amizade trip and helps students make the connection between their own circumstances and how things are when they return. 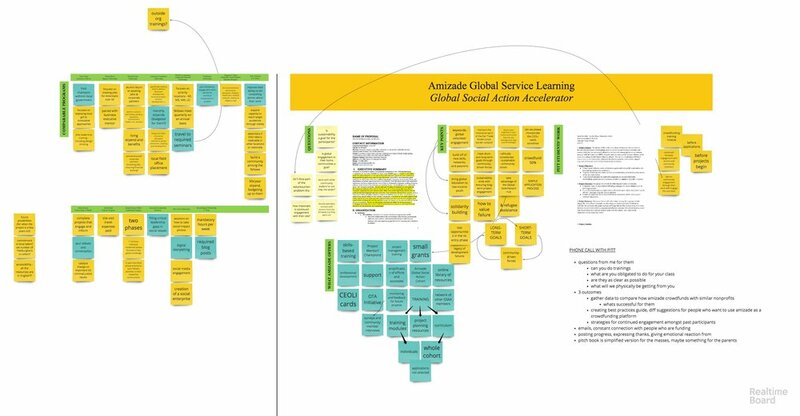 I spent a good amount of time brainstorming how Amizade could maintain a good working relationship with the GL after the trip so that they would be inclined to recruit more students for future Amizade trips. As it stood at the time, Amizade’s only engagement with the GLs beyond the trip were only a few phone calls. Given my research (which included an interview with a past GL), the solution that I came up with aimed to reset the GL’s mindset about their home environment. Because Amizade is so thorough in their preparation, each trip involves a number of orientations. Following that model, Amizade would work with the GLs to orient themselves back in their home following the life-changing experience they had abroad. The new community would work in principles from their trip into their “new” lives at home, including the importance of reflection, presentations sharing experiences, and a support group for handling the responsibilities of leadership and of re-orientation. Although this project eventually fell by the wayside as we worked on GSAA, I enjoyed exercising my design-thinking skills (see below). As an intern I naturally filled other roles as necessary. As I was working primarily with Amizade’s Marketing and Communications Coordinator Daniel Alexander, I worked on several blog posts including this one on my internship experience, this one on Amizade’s evolving social media engagement, and this one about youth’s involvement with gun control. I also designed this year’s program t-shirt using color psychology and working within budgeting and spacing limitations. Lastly, I enjoyed helping out with other organizations in the Switchboard Hub (such as creating a Mayday parade map for Justice at Work) and drafting templates for Amizade’s press releases.